Use coupon "APRIL-20" on Iso Whey Zero 25g and save 20%. Use coupon "APRIL-20" on Iso Whey Zero 500g and save 20%. Use coupon "APRIL-20" on Iso Whey Zero 908g and save 20%. Use coupon "APRIL-20" on Iso Whey Zero 2270g and save 20%. Iso Whey Zero by Biotech has ZERO sugar, helping you build muscle without gaining fat. If you want to be stronger and more muscular without adding kilos of fat then the most important supplement for you will be a high quality isolate whey protein. Iso Whey Zero is isolate which means that the non-protein components were removed. In other words, the whey protein was isolated away from sugar and trans fat! Iso Whey Zero is ideal for who wants to gain lean muscle, men and women with tendency to gain weight, and for everybody who is looking to have a toned and ripped body. Have a question about Iso Whey Zero? What is it, what does it do, how and when to use or something else? Ask us. “Iso Whey Zero 500g” is currently out of stock. Enter your details below and we will let you know when it's back in stock. 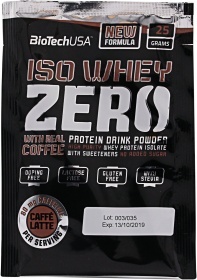 “Iso Whey Zero 2270g w/Real Coffee” is currently out of stock. Enter your details below and we will let you know when it's back in stock. Mix one serving (25g) Iso Whey Zero with 200ml water or skimmed milk.